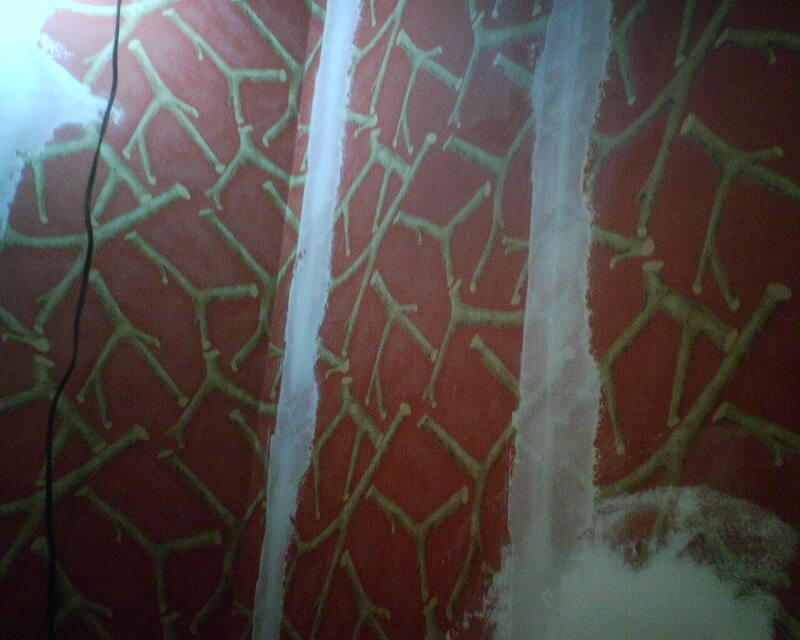 The walls in this house had a pretty heavy texture, which I wanted to smooth before hanging their wallpaper. This involves skim floating the walls with joint compound (commonly referred to as mud). Do a search on those terms here to learn more about this process. Once the mud is dry, I sand it smooth. 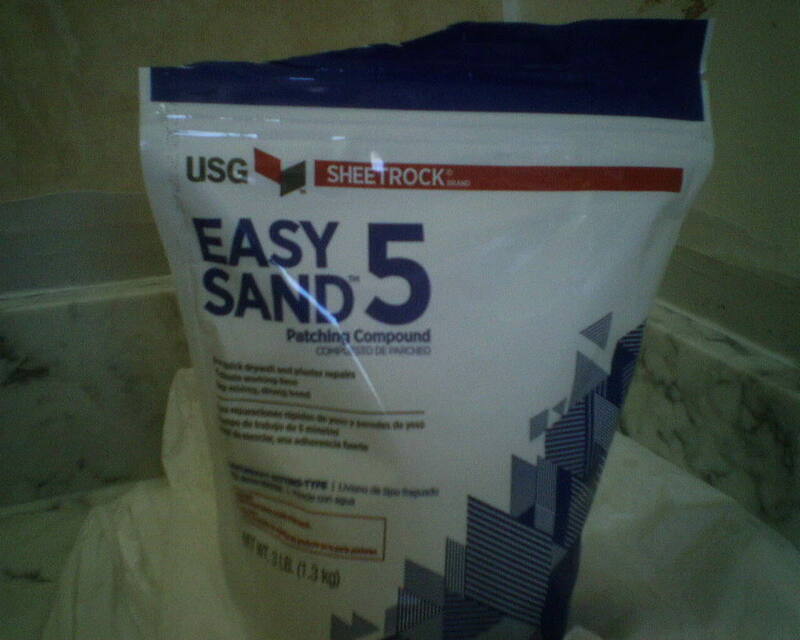 This makes a dust – and the thicker the wall texture, the more the dust. Here you see what has accumulated on the floor after sanding. Don’t worry – I bring in my Shop Vac and clean all the dust up. Almost always, when homeowners are switching from an outdated wallpaper to a new pattern, I am able to get the old paper off the wall. But twice this week I have run into papers that would not come off the wall – at least, not without causing significant damage to the Sheetrock or creating other problems. Sometimes it’s because they were installed improperly in the first place. And other times it’s just the nature of the beast. 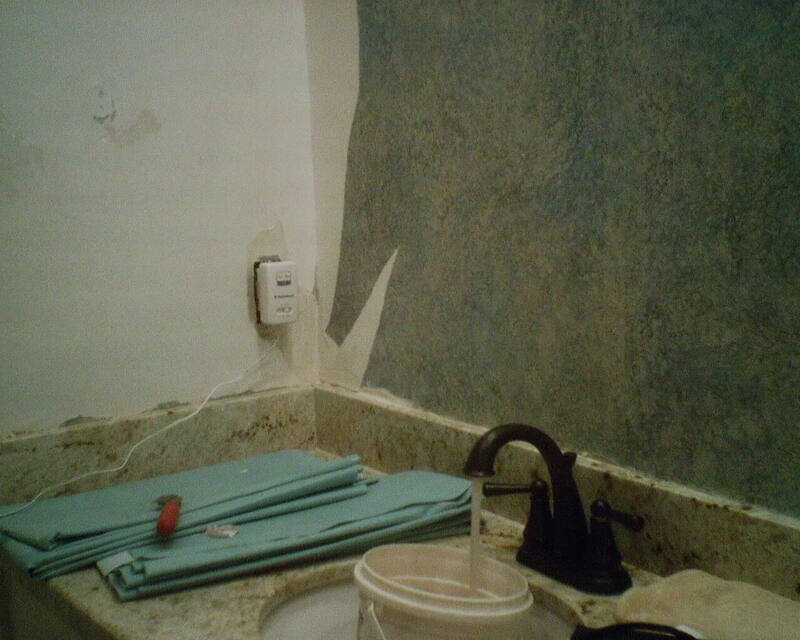 Either way, it is possible to hang wallpaper over old existing wallpaper – IF the walls are prepared correctly. In these two rooms, I used joint compound (“mud”) to skim float over the seams in the original wallpaper, to ensure that they would not telegraph through and show up as vertical lines under the new wallpaper. These are the white stripes and patches you see in the photos. 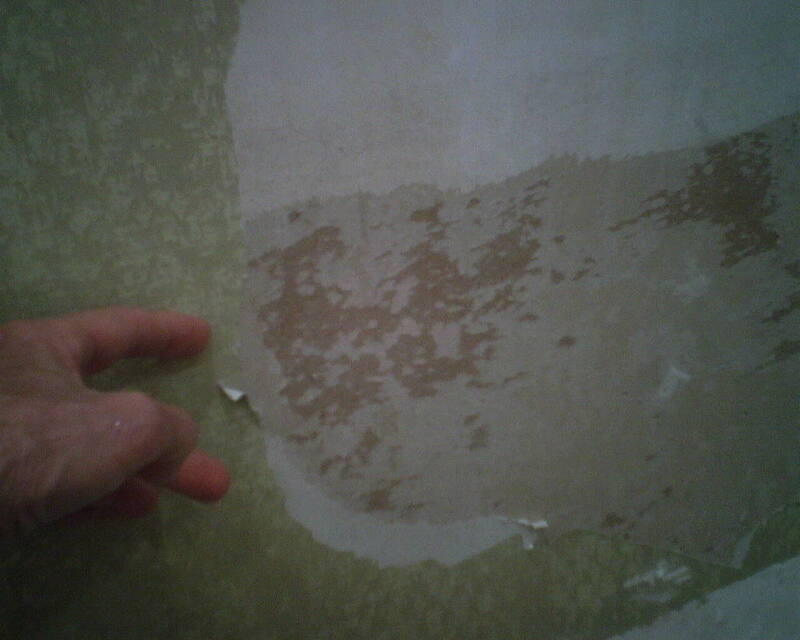 Then I sanded the mud smooth, making sure that the edges were feathered out, so the joint compound patch would not be detectable under the new wallpaper. 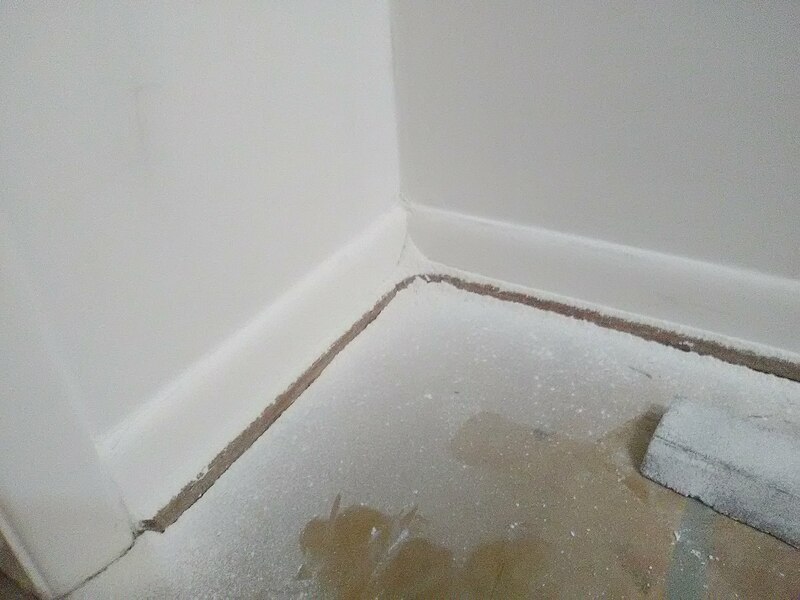 I used a damp sponge to wipe dust off the sanded areas. The next step was to seal the walls with a penetrating sealer called Gardz (by Zinsser). Gardz is a thin liquid sealer that soaks into the surface and binds it together. It dries hard, and prevents moisture from passing through. 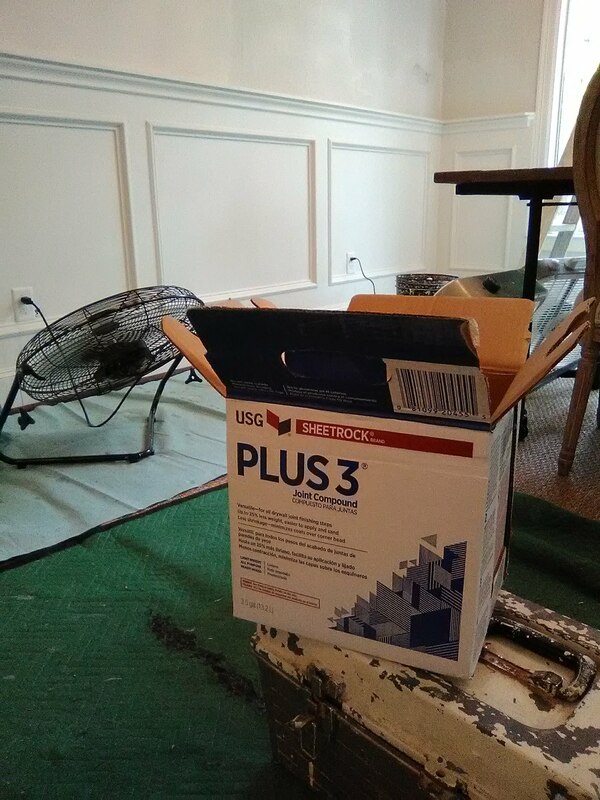 In other words, you can hang wallpaper that is wet with paste on top of this primer, and not worry about moisture passing through and causing the original paste to loosen, or the original paper to swell and bubble away from the wall. Bottom line – Gardz is a super fixer of problem walls, it’s a wonderful sealer, and it is a great primer for using under wallpaper. I am going to hang grasscloth in this large master bedroom in the River Oaks neighborhood of Houston. 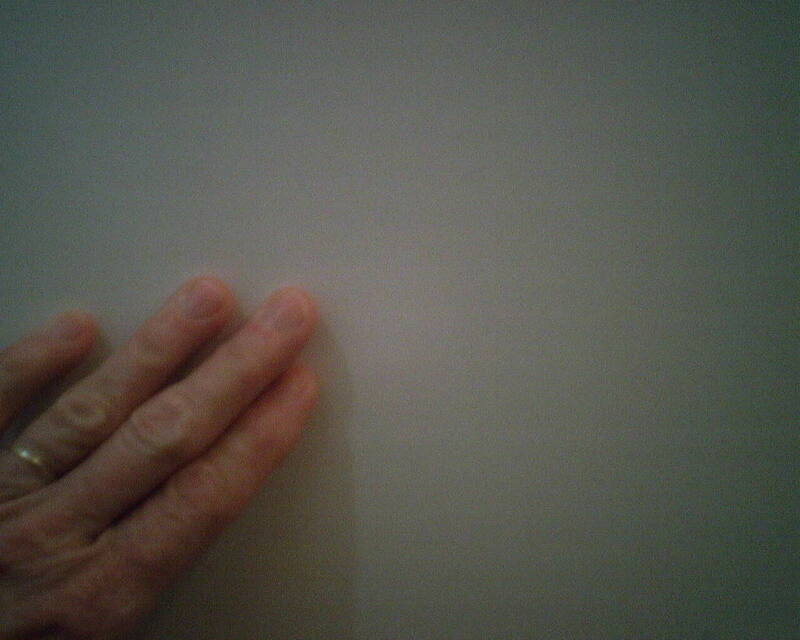 To smooth the textured walls, I skim-floated the walls with “mud” (joint compound). 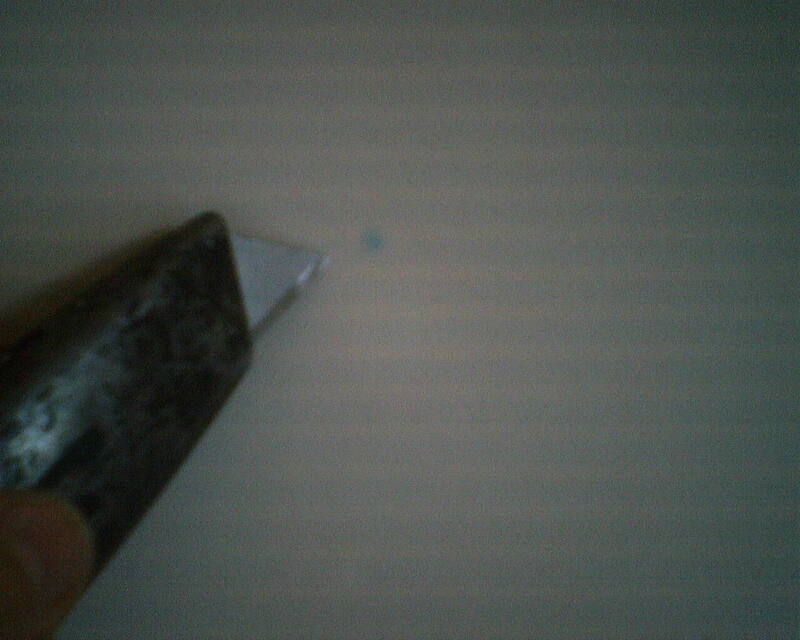 As I was sanding the compound smooth, I discovered this small blue spot. It might be ink. Or maybe some cleaning solution, or a cosmetic or perfume, or some other agent. SOMEthing was on the wall before I applied the smoothing compound, and bled through. Whatever it is, it worked its way through the smoothing compound and up onto the wall surface. If a substance works its way through the wall surfaces, you can be sure that it will also work its way through the new wallpaper. To prevent this, there are a couple of options. One is to cover the area with a stain-blocking sealer. I love oil-based KILZ Original. Another product is BIN by Zinsser, or 123 also by Zinsser. But in this case, since it is just a tiny dot, I decided to use a Stanley knife to dig out the stain. Gone. Done. No worries about anything bleeding through the wallpaper. 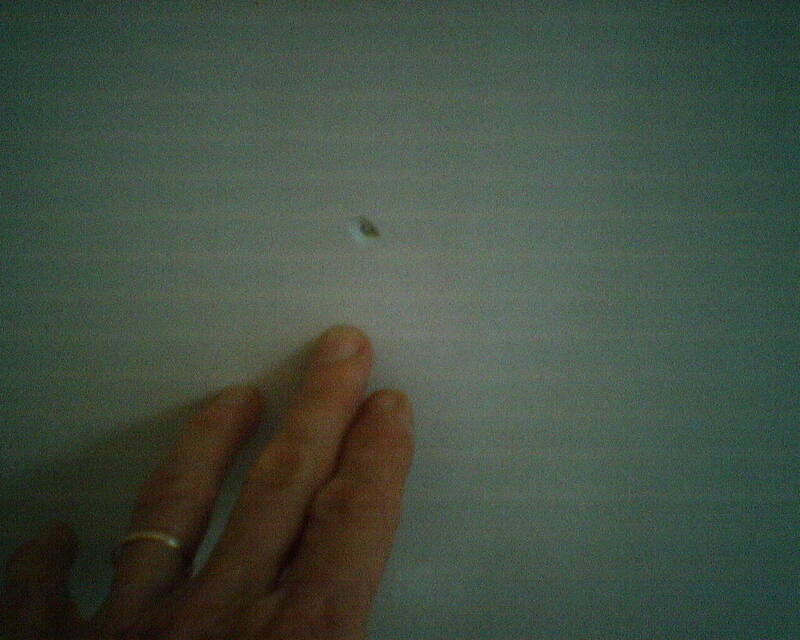 If the new wallpaper had a smooth surface, I would patch over the hole and sand the area smooth, and spot-prime. But since the new wallpaper is a rough-textured grasscloth, this 1/4″ dent in the wall will not be noticeable, so I’m going to leave it as it is. Tomorrow, before hanging paper, I will double check to be sure no additional blue stain has worked its way out from hiding. The homeowners of this house in Fleetwood (west Houston) tried to remove the wallpaper from their powder room on their own. They did a reasonably good job at the start, but soon realized that they were in over their heads. In the top photo, they have removed the top layer of wallpaper from the wall on the left. 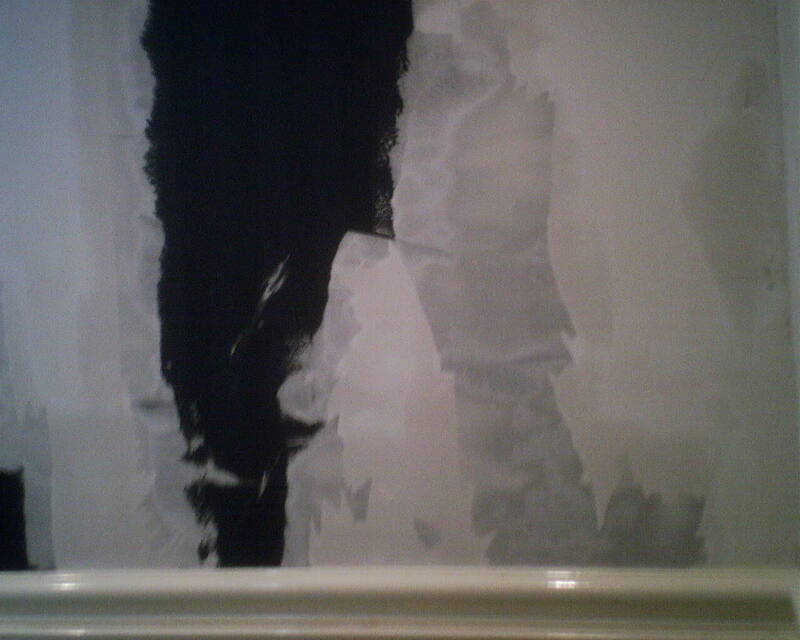 The problem came when trying to take off the white backing layer. 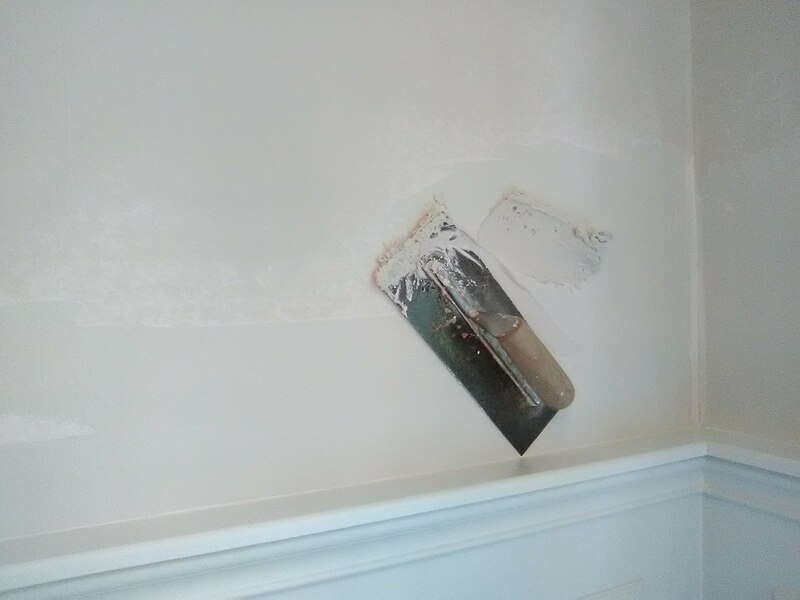 Their efforts resulted in torn drywall (second photo). 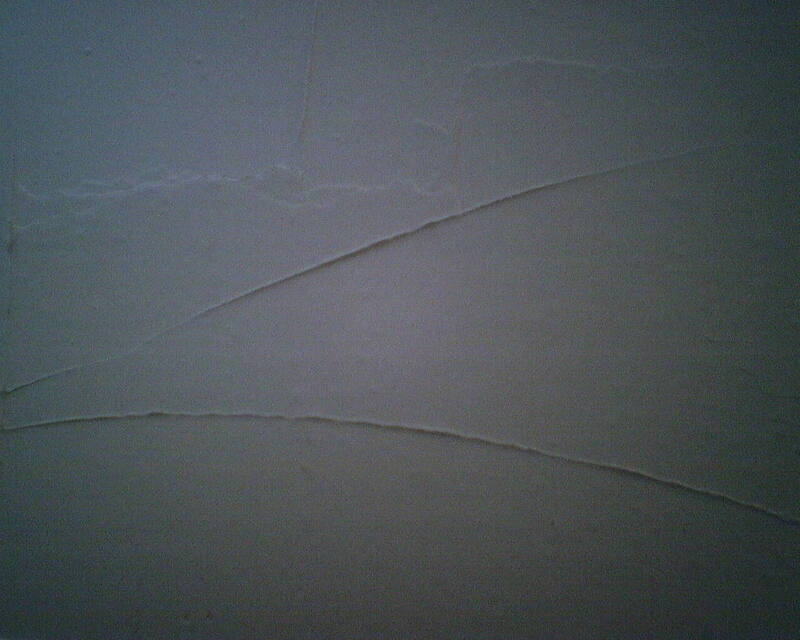 Torn drywall is very bad, because it will leave uneven areas under the new wallpaper / paint. 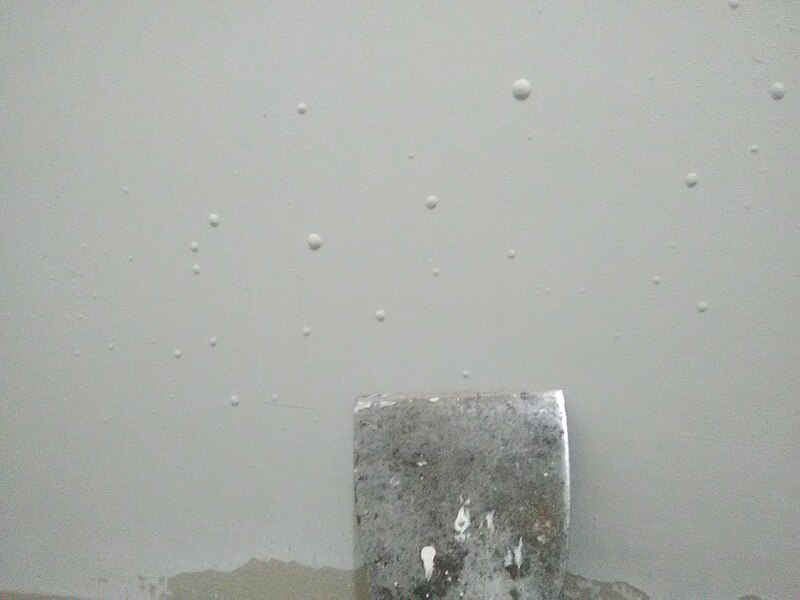 Worse, it will bubble when the moisture from the wallpaper paste or latex paint touches it, and that will leave bubbles under the new wallpaper / paint. These homeowners were smart enough to stop before more damage was done, and called in the pros (me). 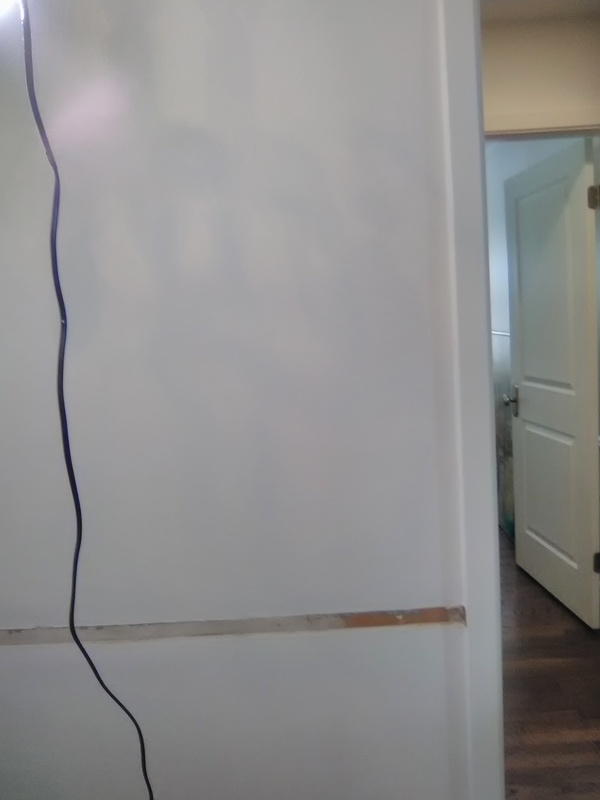 I finished stripping off the old wallpaper, using methods that caused less damage to the drywall. There was one patch of original wallpaper, a foil-type that dated back to the build date of 1976, that would not come off without a lot of damage to the wall. I left that section on the wall. Once all the paper was off that would come off, I sealed the torn drywall and other unstable surface areas with Gardz, a penetrating sealer. Once that was dry, I skim-floated the entire room with “mud,” (joint compound). When that was dry, I sanded the surface smooth. Then I vacuumed up the dust, then wiped any residual dust off the walls with a damp sponge. Lastly, I rolled on another coat of the penetrating sealer Gardz. It will dry hard and tight, preventing the torn drywall from bubbling, and holding all the loose or unstable areas together. It is also a good primer for wallpaper, so tomorrow the walls will be prepped and ready for their new décor! See last photo. 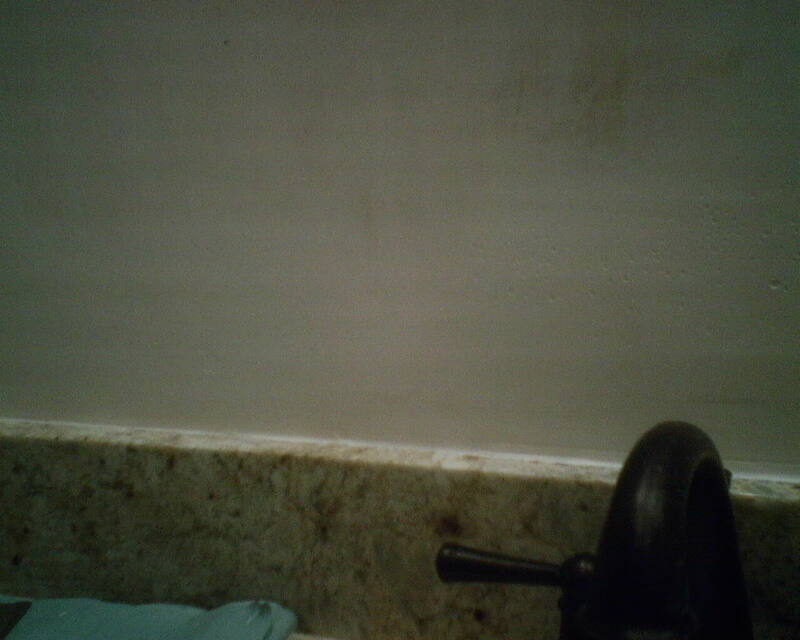 The walls in this powder room were way too heavily textured (Photo 1) to even think about putting wallpaper on them. For one thing, those ugly bumps would show under the paper – and might even poke holes through the surface. 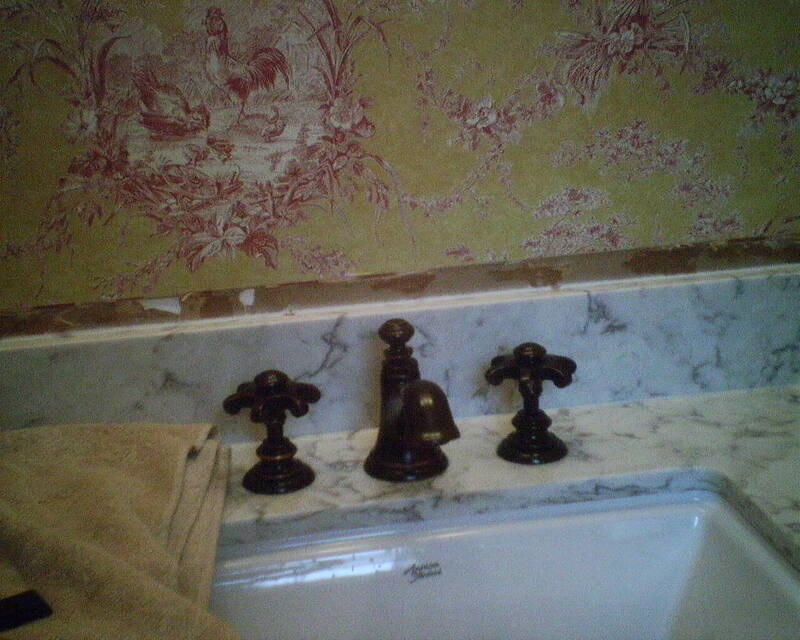 For another, the wallpaper would not have a smooth, intact surface to cling to, resulting in poor adhesion. So I smoothed the walls. To do this, I trowled on joint compound, (we nick name it mud), which is a plaster-like substance used mostly for drywall installations. The initial layer was thick, and had to dry overnight. In the morning, the surface was dried, as you see in Photo 2. 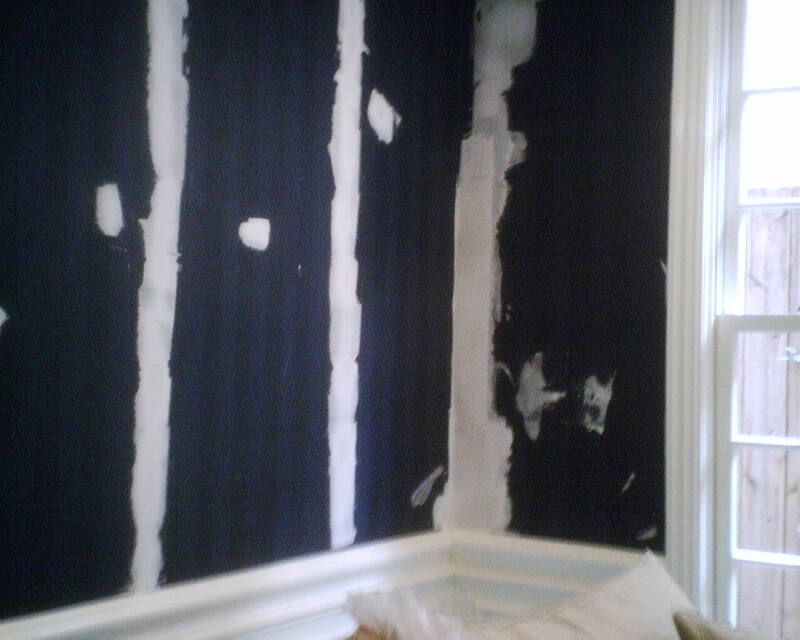 Dry, but way unacceptable for wallpaper … All of those ridges and uneven surfaces would show under the paper. 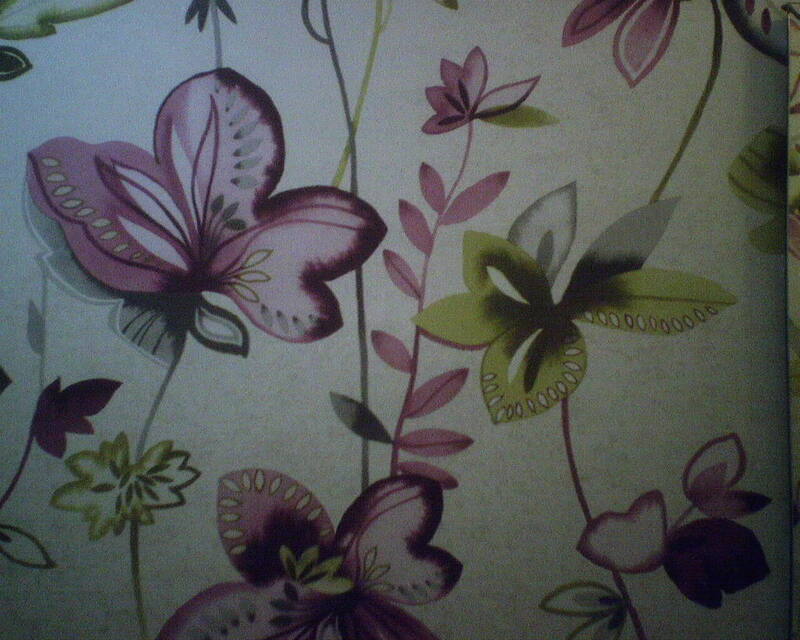 I sanded this surface down, and it was much better – but still not acceptable for wallpaper. So I skim floated again, with a very thin layer of mud. Once that was dry, I sanded one more time. And ended up with the perfectly smooth walls you see in the 3rd photo. 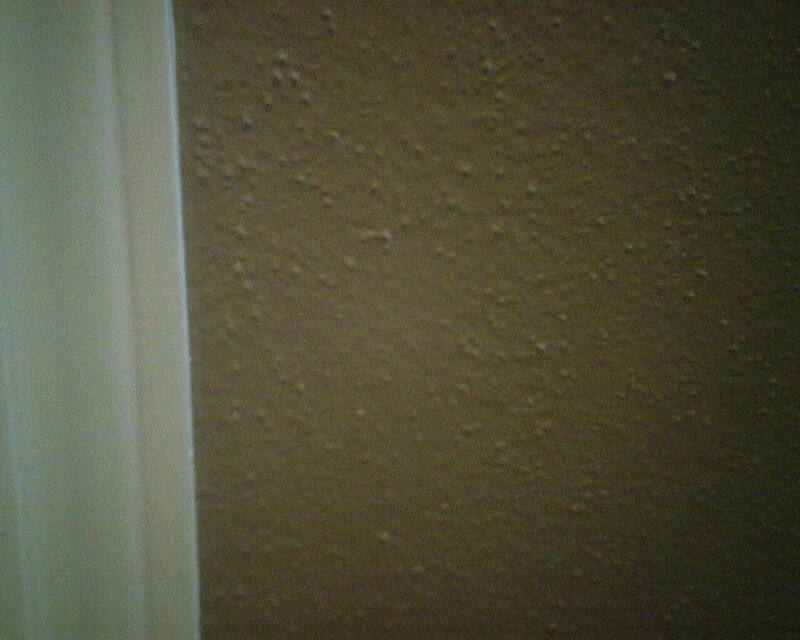 In the last photo, you see the wallpaper on the wall, perfectly smooth, and with no signs of bumps or texture or ridges or uneven areas.